During the next Formula E season, there will be a self-driving car race before some of the upcoming ePrix races. The new championship is called Roborace. Teams of software engineers will compete on vehicles all equipped with the same hardware and the first working prototype, called ‘DevBot’, is now available for testing. 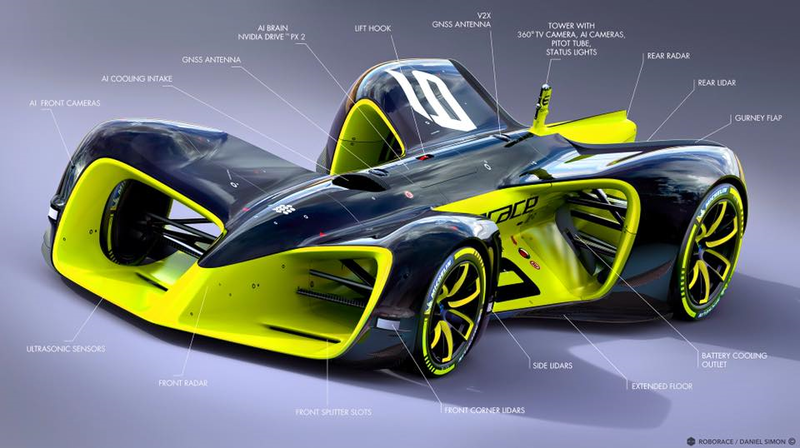 Of course, like the Formula E cars, the Roborace cars, dubbed ‘Robocar’, will be all-electric and serve as test beds for new technologies. The suite of sensors and computation systems in the DevBot, and ultimately in the Robocar, is very impressive. We are talking about radar and lidar antennas in the front, back and sides. It’s also equipped with front-facing cameras and a 360-degree camera in a small tower at the back of the vehicle. The whole system is powered by Nvidia’s new Drive PX 2 self-driving computing platform. Formula E says that DevBot will be at Donington Park on August 24th for open practice, but the actual Roborace chaimpoionship will not start for at least another 6 months, which means alongside an upcoming ePrix at some point in the Formula season 3.